The Webasto Breeze started as a concept two years ago when Four Winns’ designer Christophe Lavigne was looking for ways to extend the boating season. Lavigne wanted a convertible air-conditioning and heating system that worked in an open cockpit so boaters could start the season a month early with heat, cool themselves through the summer, and use heat again boating into the fall. Lavigne looked at different systems using small generators and battery-powered units, but nothing was ideal for the marine environment. When he turned on the A/C in his car, a lightbulb went on in his head. Lavigne came back to Woolard and said Volvo Penta would like to work on the project. Two years after the idea was conceived, the first Webasto Breeze was introduced two weeks ago at the Four Winns dealer meeting in Sarasota, Fla., aboard the builder’s HD270 model. The Breeze is powered by a Volvo Penta sterndrive that produces up to 7,000 BTU at idle or slow speeds and up to 30,000 BTU at high engine rpm. 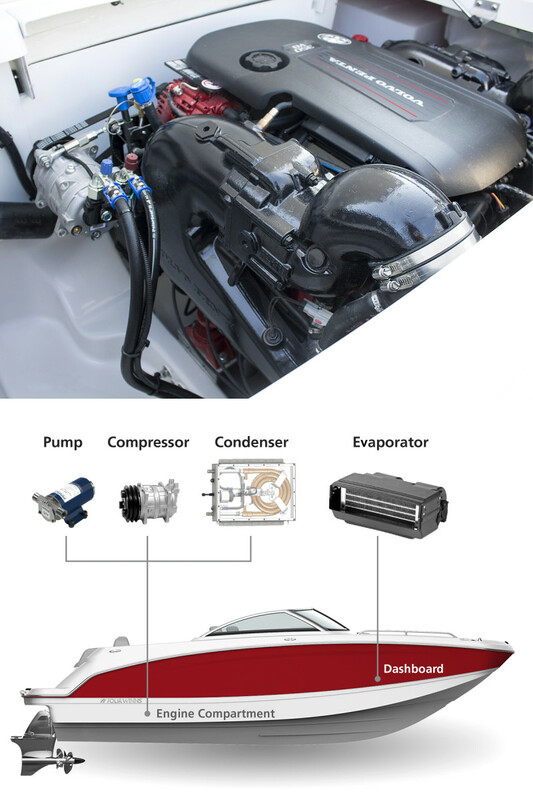 Volvo Penta supplies an upsized alternator and mounting bracket, and Webasto provides the Breeze’s belt-driven compressor, evaporator, condenser, seawater pump and dash-mounted controls. The 12-volt DC system does not require an auxiliary generator. Wollard said the Breeze is being prototyped by other boatbuilders and will also be sold as an aftermarket add-on for dealers.